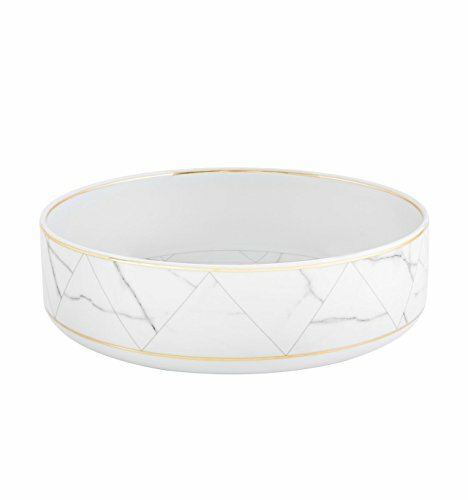 VISTA ALEGRE - CARRARA (Ref # 21124427) Porcelain Salad Bowl by Coline Le Corre • Material: Porcelain accented with 24 carat gold and Hand-painted elements • Height: 86 mm * Length: 285 mm * Capacity: 3867 ml * Weight without Package: 1660 gr * Not suitable for microwave or dishwasher use (hand wash ONLY) • The combination between porcelain and drawings inspired by the noble marble of Carrara, a very refined, geometric approach, creates the illusion that each piece of the set is interchangeable. • Founded in 1824, Vista Alegre the oldest porcelain workshops in Portugal and one of the most prestigious manufacturers in the whole of Europe. Innovative from its inception, the brand's trademark is striking contemporary pattern and colour. From Art Deco-inspired metallic finishes, to bright butterflies designed by Christian Lacroix, each piece demands to be the centre of attention.